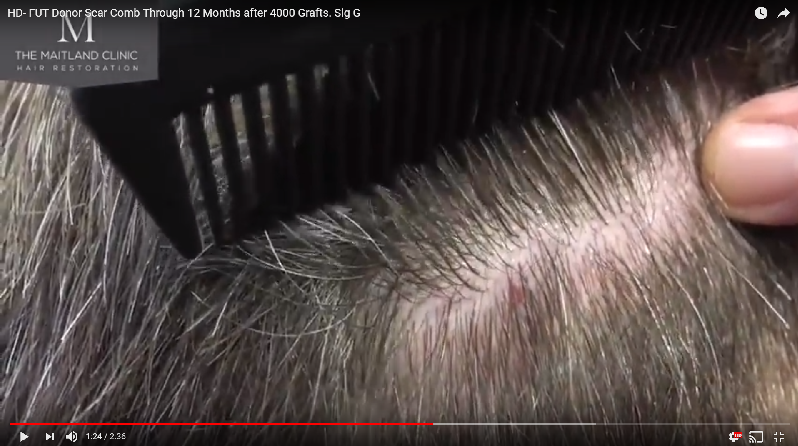 Sig G kindly came to see Dr Ball and myself at our Hampshire clinic in December to show off his results of his 4000 graft FUT case that we have all been following through his YouTube video diaries. Sig G is quite rightly delighted with his results one year after surgery and has made a big difference to how he looks and feels about his hair. One of the most difficult things for Sig to film was his fut donor scar and we wanted to put that right with a HD video shot by myself not just combing through the donor area to see if it is visible but stopping to point out exactly where it is. When choosing FUT one of the biggest considerations for patients is the scar and whether it will limit a short haircut sides and back after surgery. Dr Ball takes this very seriously and always points out to patients that the scar can be unpredictable and even when as much care is taken with the closure as possible some patients will heal with a wider line scar that might be more visible than Sig G’s. However when the stars align and care is taken by the surgeon and the patients healing characteristics are favourable then scars that are very difficult to find like this one are possible. Enjoy the video and don’t forget to bookmark this page as we will be adding a full photoset of Sig G, comb through of the recipient area and interviews with Sig G, Dr Ball and myself…stay tuned!